Naxian Collection Luxury Villas and Suites offers breathtaking views of the sea and the surrounding green hills, and a family-friendly vacation. Suites and villas reflect true Cycladic style while offering modern conveniences such as plush, ultra spacious bathrooms. Villas feature private or semi-private pools in pristine natural surroundings. Adventure awaits, with windsurfing, enchanting nature hikes, museums and much more nearby. Embark on a gastronomic feast with a Mediterranean menu featuring produce from the hotel's organic garden. 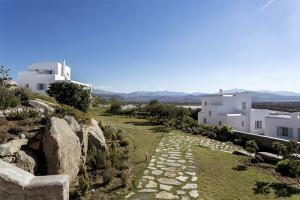 Located in Naxos, Greece, approximately two miles from the airport.